RG Herald: Who Will Be The New Queen? Who Will Be The New Queen? 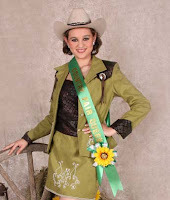 On Sunday, February 20, Andrea Noles will be turning over her crown to a new Queen who will reign over the Youth Fair which is scheduled to start on Thursday, February 23, 2011. This year’s pageant will be held at San Isidro High School auditorium. The pageant rotates throughout the county to bring the enthusiasm and excitement to community for the largest event that brings together students from every school in the county. We want to invite the youth of the county to get involved in the pageant and became part of this excellent character building experience that heightens confidence and self esteem. For more information you can call the County Extension office 487-2306. Applications for the pageant are available at all school principal’s office and from 4H Club Managers and at the county Extension office located at 500 N. Britton Rio Grande City, TX.